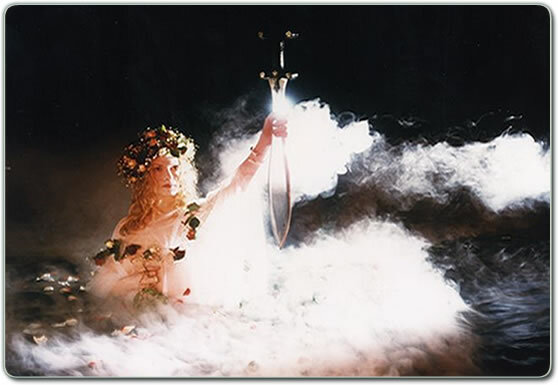 The sword talisman made by Michael King for the Rheged film 'The Lost Kingdom"
In 1982, I started my own jewellery business in a barn at my home at Curthwaite in northern Cumbria. In 2001 I opened new premises at nearby West Woodside, on the A595 eight miles SW of Carlisle, providing space for a large new gallery showing a wide range of gold and silver pieces. 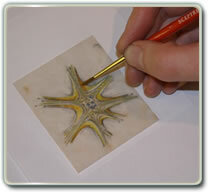 During the last 20 years I have completed many important commissions. Among them have been a series of ornate weapons recalling the wonderful workmanship of the early Britons for the film 'The Lost Kingdom', commissioned for the Rheged Centre near Penrith, Cumbria. More recently, I was commissioned to copy the beautiful cross of St Cuthbert, kept in the treasury of Durham Cathedral, for a film about the life of the saint. 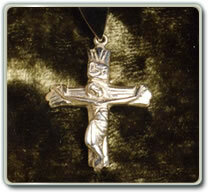 Past commissions include a facsimile copy of an ancient crucifix for Queen Elizabeth II, a ceremonial cross for Carlisle Cathedral and a cross and ring for the Bishops of Penrith and of Jarrow. Wedding and engagement rings and decorative jewellery form a basis of much of my work. Celtic art has been a strong influence as Cumbria's relatively unspoiled rural environment was once part of the Celtic kingdom. I have always been fascinated by contrasts of highly polished and granulated, textured surfaces. Some of my pieces are constructed around silver coral, a technique of simulating natural coral by a unique casting process I developed myself. 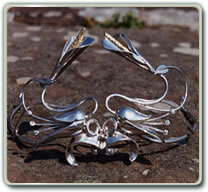 Tiara in sterling silver to an Art Nouveau design. 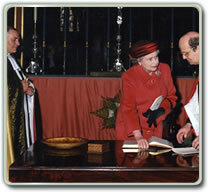 Silver cross presented to HM Queen Elizabeth II to mark the 900th anniversary of Carlisle Cathedral in 1988. 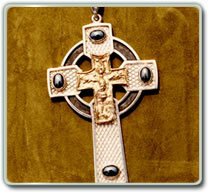 Cross designed and made for the Bishop of Penrith, Cumbria. At the centre is a pilgrim's cross made from a 14th century mould found at Keswick, once a pilgrimage centre for St Herbert. On the arms of the cross are four oval haematites mined at Egremont, Cumbria.